Hey! I was going to start a site called "Band Name Whiteboard," but, as is often the case with my brilliant ideas, some cool person is already doing it! I enjoyed your mythical fonts whiteboard too. 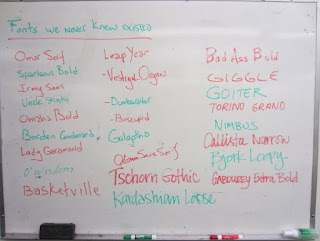 (It's missing "Idiot Sans" which refers to all client-requested handwriting fonts.) I might still start a Band Name Whiteboard facebook page, though, so keep an eye out!